An elderly couple married for 62 years has been forced apart because there is not enough space for them at the same residential care home. 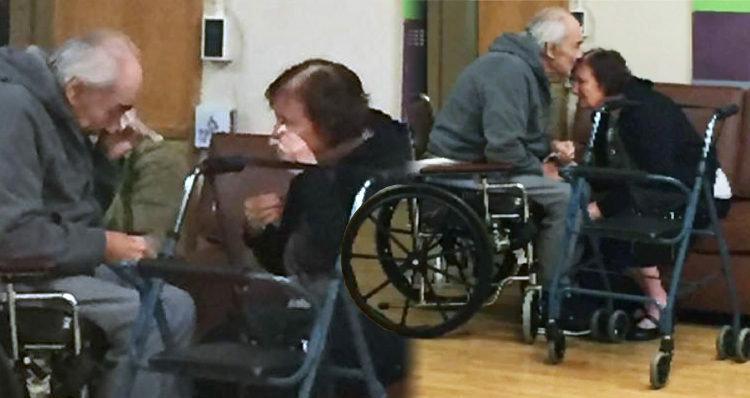 A Canadian couple, married for over six decades, has been forced to live apart due to a lack of space in the same nursing home. CTV News reports that “Wolf and Anita Gottschalk have been married since 1954” and, according to their granddaughter, Ashley Bartyik, have rarely spent any time apart. “After 62 years together, they’re inseparable. They do everything together,” she says. Wolf is on a waiting list to move into The Residence at Morgan Heights, the nursing home where Anita is cared for, “but the Frazer Health Authority can’t say when that will happen, according to CTV News. “My grandma can’t even kiss him goodnight now. He calls out for her when he sees her,” says Bartyik. “We certainly understand how heartbreaking this is for the family. It’s upsetting for us as well,” spokeswoman Tasleem Juma told CTV News in an email. Frustrated, Bartyik posted a photo of her grandparents on her Facebook page. “This is my Omi and my Opi. As you can see they are both wiping away tears! But why? It was taken in Surrey at Yale road, a transitional facility for people waiting to get into nursing homes, that’s where my Opi is! After 62 years together in marriage they have been separated for 8 months due to backlogs and delays by our health care system, whom have the power to have my grandpa moved to the same care facility as my grandmother. “They cry every time they see each other, and it is heartbreaking. To make it worse, TODAY he was diagnosed with Lymphoma. Besides that limiting his time and making this more urgent, His Dementia is growing ever stronger each day, but his memory of my grandmother has not faded a inch…yet. “They deserve this! Financially, physically and emotionally exhausted, me and my family are begging for your help my friends. We have contacted our local MLA, called Fraser Health and done in person inquiries, but none of our questions and concerns have been answered. We want justice for my grandparents who after 62 years together deserve to spend their last moments in the same building.